I have heard amazing things about the show, Bones, and I can't believe they are already on Season 7! 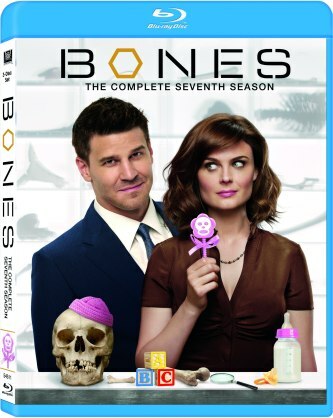 If you need to catch up, get the newly released Bones Season 7 Blu-ray! Experience People's Choice Awards nominee Bones* in a whole new way with never-before-seen footage not available anywhere else! While she tackles some of her most gruesome homicide cases yet, Dr. Temperance Brennan (Emily Deschanel) also faces the delicate demands of motherhood, and a deepening relationship with FBI Special Agent Seeley Booth (David Boreanaz). The thrills escalate this season when a pastor's wife goes missing, shipping clerks go postal, and the squints go Hollywood. But the biggest shocker of all comes when clues left by a deranged cyber genius tag Brennan as a murder suspect. Here are all 13 Season 7 episodes with plot twists, mystery, romance and humor to die for!